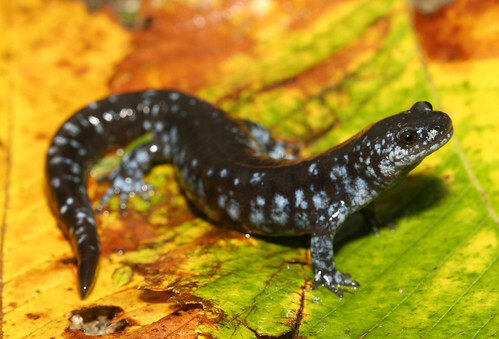 A lot of salamanders in Michigan may look somewhat odd, like a weird blue-spotted salamander that seems to share characteristics with other species of Mole salamander. The identity of these oddballs is one of great complexity and many biological questions. 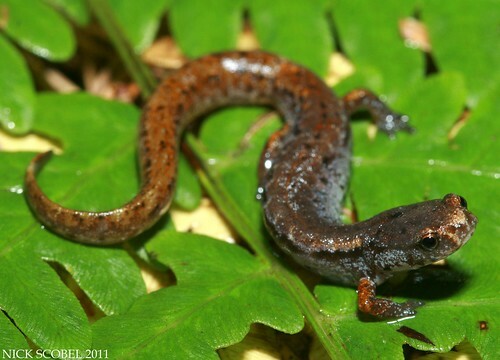 This is a unisexual hybrid salamander, an all female complex consisting of five parent species of Mole salamander which include A. laterale, A. texanum, A. barbouri, A. tigrinum, and A. jeffersonianum. 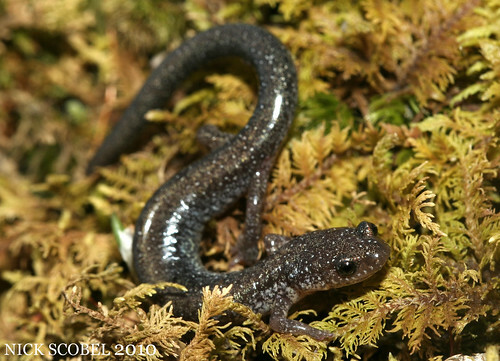 This unique group of salamanders utilizes a breeding strategy known as kleptogenesis, a method of reproduction whereby a female ‘steals’ sperm from a sympatric sexual male. The sperm is required to stimulate an egg to divide (gynogenesis) but does not fertilize the egg and may or may not contribute chromosomes to the offspring. 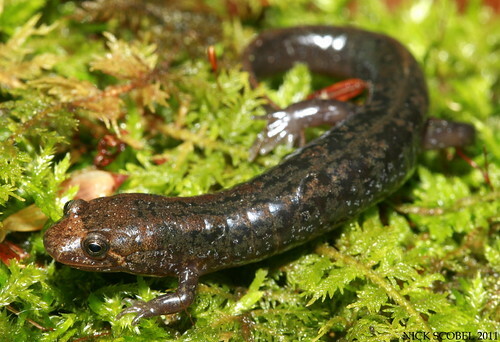 This unique form of reproduction is thought to have originated about 5 million years ago within this unique group of salamanders. 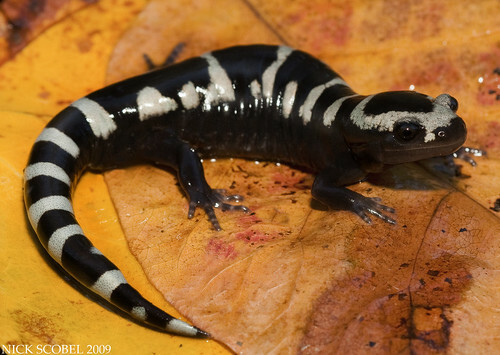 One of the most visually striking Ambystomatids, the marbled salamander is easily identified by it's black and white coloration. Adults are short and stout, attaining lengths between 3.5-5". 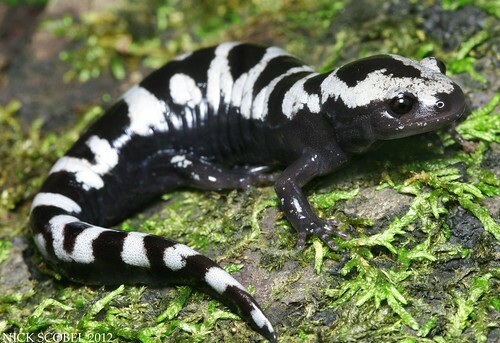 This species is most recognizable by it's black background coloration and white or gray markings which usually form bars across the back and tail. 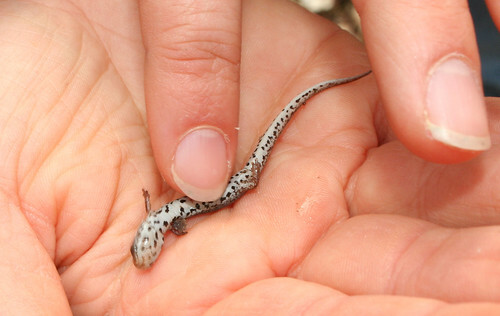 This species is sexually dimporphic; females tend to have gray markings, while males feature bright white markings. Juveniles look like miniature versions of adults, but tend to have light gray markings like those of adult females. 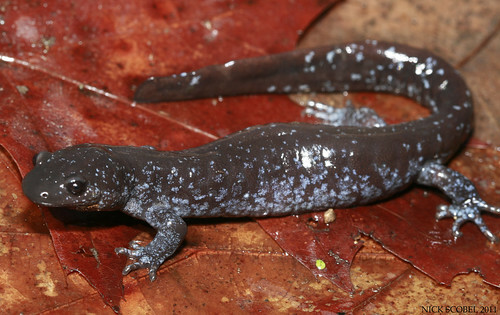 The natural history of this species in Michigan is poorly understood. 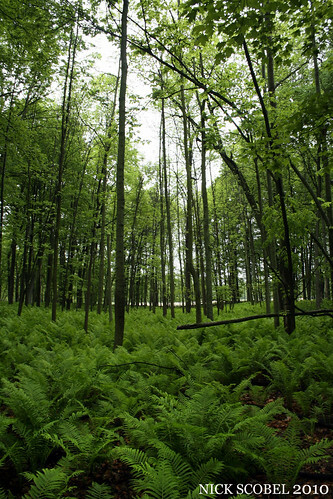 The first specimen was not found in the state until 1950 in the southwestern lower peninsula. 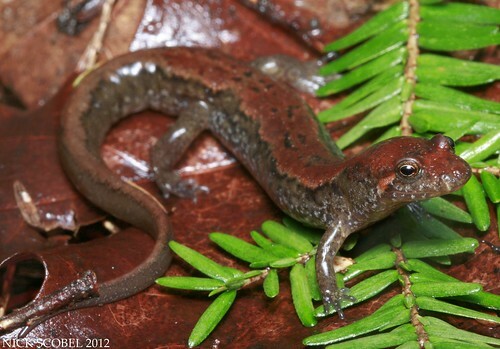 Only a handful of specimens have been documented in the state, the last one being in 1989. It has only be documented in Berrien, Van Buren, and Allegan counties and it is likely that it is extirpated in the state. 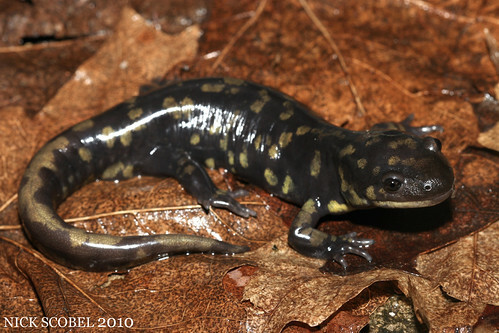 Throughout their range, marbled salamanders are known to inhabit moist lowland forests and adjacent upland forests where they are often found under logs and the leaf litter. This species is different than other Ambystomatids in that it is a fall breeder. Females lay eggs under logs and other cover during the fall and await the fall rains to fill the dried pools that other species use during the spring months. 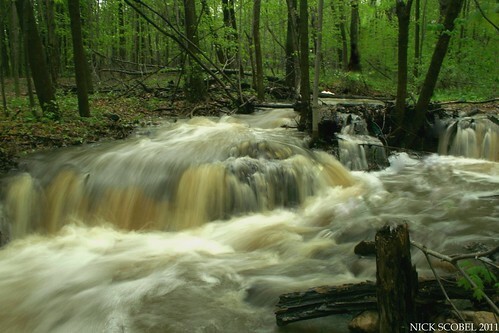 It's unclear to what breeding habits or habitats this species utilizes in Michigan because of the lack of documentation, but it's likely that Michigan individuals follow the same ritual. Documentation of this species in Michigan would be very exciting, so any observation of it should be reported promptly to the Michigan Herp Atlas. 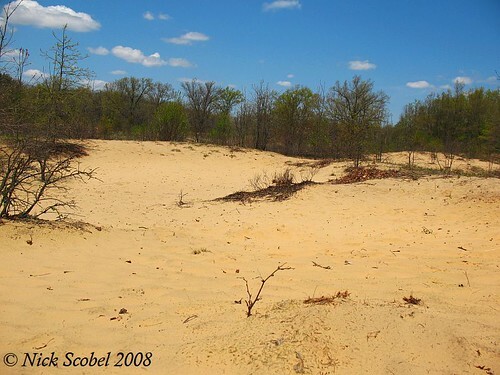 This species reaches its northern range limit in extreme southeast Michigan, unfortunately this is also home to Michigan's population center and is extremely developed. Though this species was probably not very common historically, its breeding habitat has become fragmented and lost and there are now only a handful of breeding populations left. 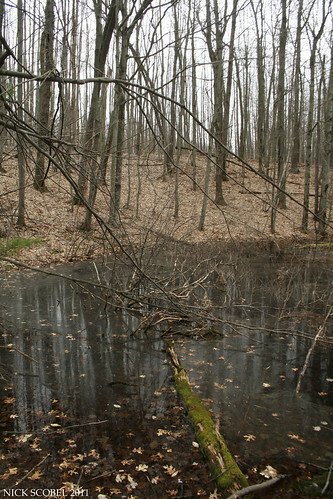 As you can see, human habitation is on the bordering edge of this site and is the main reason for decline of the smallmouth salamander in Michigan, it is listed as an Endangered species here. 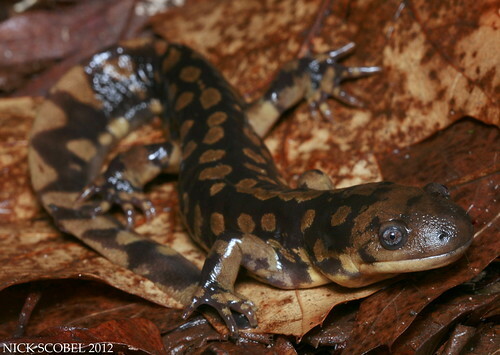 It is one of the earliest breeding species in Michigan and may be found sharing pools with Eastern Tiger Salamanders. Any sightings of this species should be reported to the Michigan Herp Atlas. Males have a characteristic vertically flattened, rudder-like tail while adult females exhibit a more rounded, tapered tail. Adults are rarely seen outside of the breeding season which occurs in early to mid March. 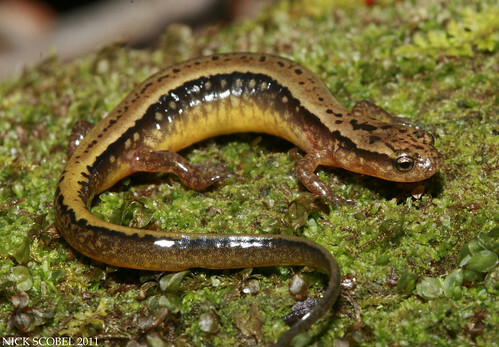 Tigers are one of the earliest breeding salamanders in Michigan and often enter breeding pools with plenty of remaining ice cover, all that is needed is a few feet of the edges to be thawed. Females and males spend a few days in breeding pools for a few days and that head back underground for the remainder of the year. 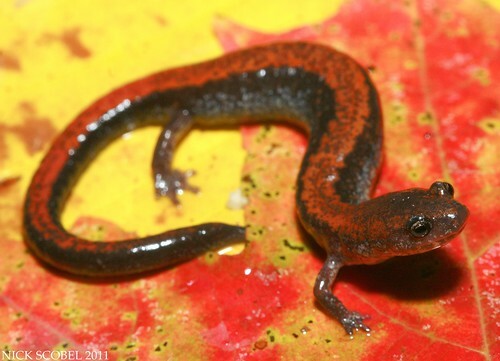 Metamorphs emerge in late summer and resemble adults but can range from 3-5 inches and are usually dark in coloration. 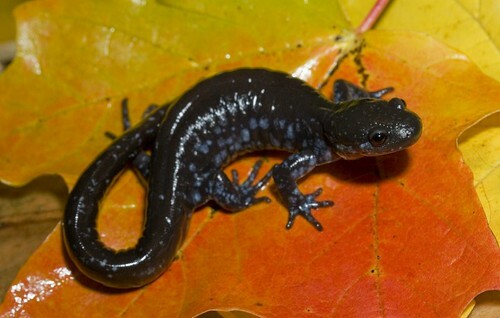 This colorful species is by far the most common species of salamander which inhabits Michigan. It is easily characterized by the red stripe which runs down its dorsum. However, this species comes in both a "redback" and "leadback" color phase. 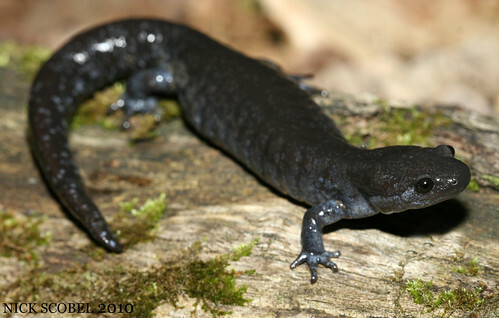 These large aquatic salamanders are the largest species of amphibian which inhabits the state, with adults ranging from 8-15 inches. 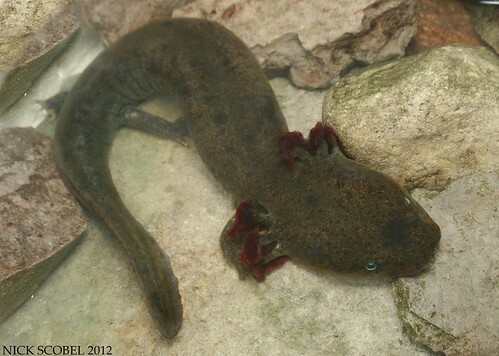 Mudpuppies are neotenic, meaning that they retain larval characteristics through adulthood. 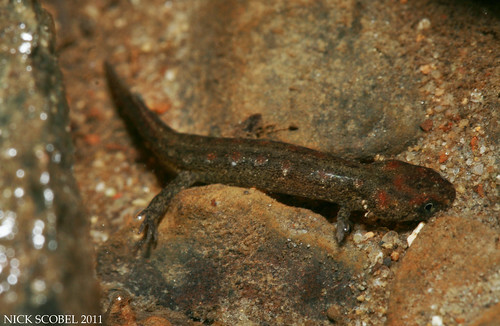 In the case of this species, the external gills which most larval amphibians have are never lost as mudpuppies mature, making them a permanent resident of aquatic environments. 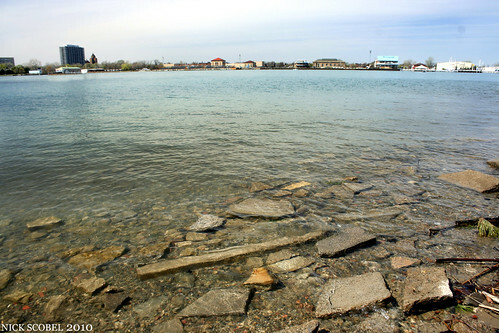 They prefer cool, oxygen rich waters with plenty of rocks for them to hide underneath. 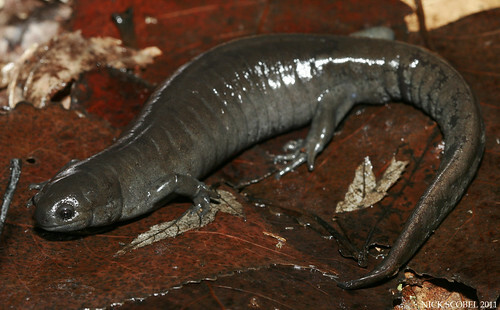 In Michigan, mudpuppies inhabit clear creeks, rivers, and deep inland lakes. 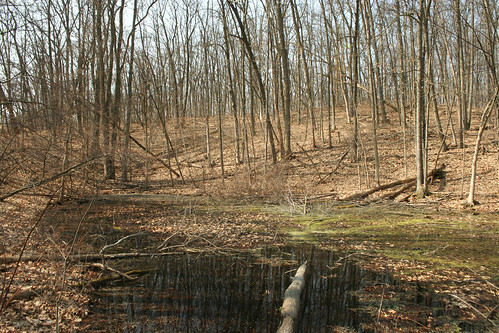 The rock strewn shorelines and bottoms of this large river in urban southeast Michigan provides ideal habitat for this species. Mudpuppies seem to be more commonly encountered in clear inland lakes further north in the state. 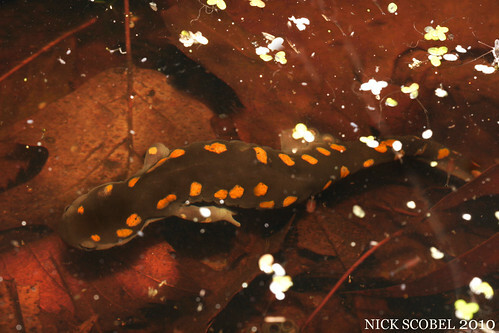 Adult mudpuppies tend to be dark in color, usually having spots along the dorsum. 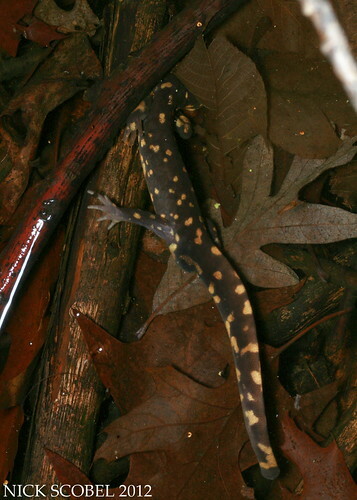 Juveniles are much brighter in coloration and have two bright mustard yellow stripes down each side of the body, the stripes may also contain dark mottling. This species is found statewide, but it's distribution in not entirely known. 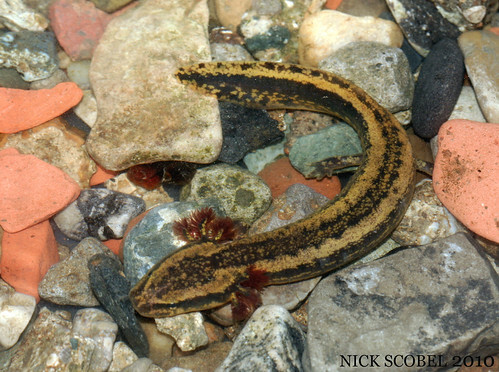 Any mudpuppy sightings should be reported to the Michigan Herp Atlas to help better understand this large aquatic salamander's distribution across Michigan. Blanchard's cricket frogs are quite small with adults averaging between 0.5-1.5" in length and are extremely variable in color. They may be tan, gray, or olive in coloration with additional dark mottling on the sides and limbs. Some even have a light line running down the back with may be green or red in color. One the best diagnostic characters for identification is the light line which runs diagonally from the eye to the corner of the jaw. Another good field mark is the pigmentation which often forms a dark triangle on top of the head between the eyes. This small species of frog was historically common across the southern lower peninsula, this species has suffered drastic declines in Michigan due to the loss of it's habitat. Blandchard's cricket frogs inhabit a wide variety of habitats including bogs, prairie fens, lake edges, and sluggish streams and are often found in the open mud flats and shorelines of these areas. 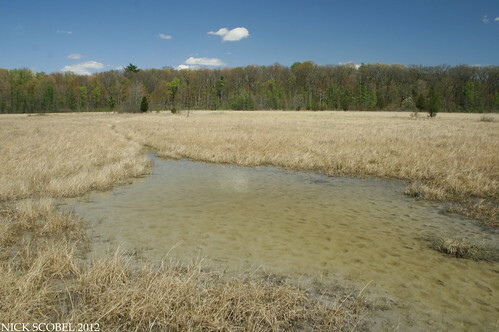 Small streams and pools in prairie fens like the one pictured above serve as ideal habitat. Breeding occurs in May and June when males begin to call. The call is similar to the sound of pebbles being tapped together and this series of clicks can last for up to thirty seconds, starting at a low tempo and increasing in frequency. 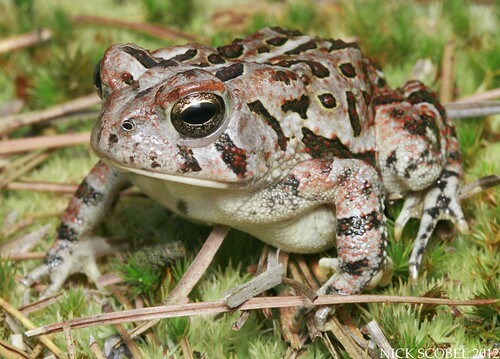 The Blanchard's cricket frog is listed as a Threatened species in Michigan and any observations should be reported to the Michigan Herp Atlas. This is the well known toad that often shows up in backyards, but this species can be found in a wide variety of habitats. The American toad can easily be identified by it's plump stature and warty skin. Though it is usually tan in coloration, this species is incredibly variable and may be brightly colored or may be almost completely black. 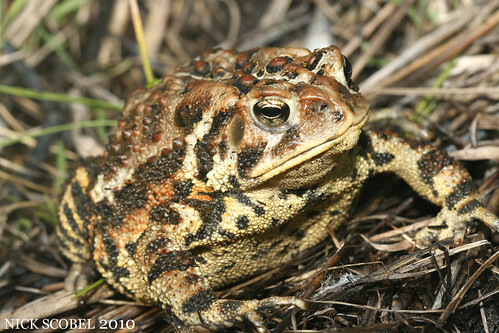 The only species in the state that is can be confused with is the Fowler's Toad (Bufo fowleri). Both are similar in size and stature, but the American toad only has 1-2 warts per dorsal spot, while the Fowler's toad often has 3-4 warts per spot, the Fowler's toad also has a light colored belly with a few dark spots. The American toad is a habitat generalist and may be found in open woodlands, open meadows, marshes, and even in suburban backyards. 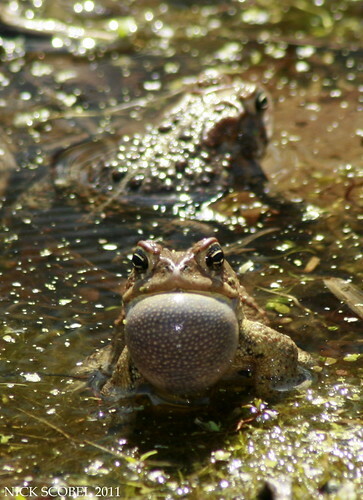 Breeding takes place in early spring and often involves large numbers of toads congregating in ponds and pools. 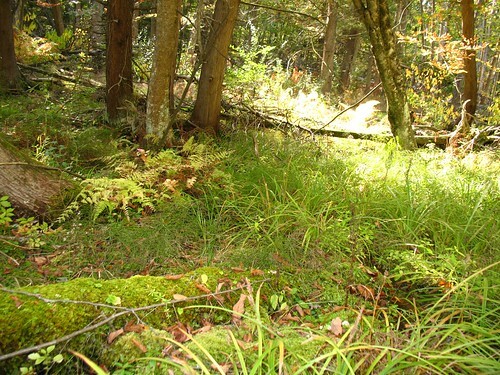 Sometimes, hundreds of individuals may be found in one spot like the photo above. The call is a loud, musical trill which can last up to thirty seconds. Fowler's toads prefer open sandy habitats such as dunes and sandy pine forests, but also may be found in suburban backyards on the west side of the state. They spend much of their time burrowed into the ground in these dry, xeric habitats and are a favorite food of the Eastern Hognose Snake (Heterodon platirhinos). Breeding occurs in May and June on rainy nights and the call of this species makes it easily distinguishable from the American toad. The call is a short, bleating cry which lasts about 3-5 seconds and sounds like "waa." 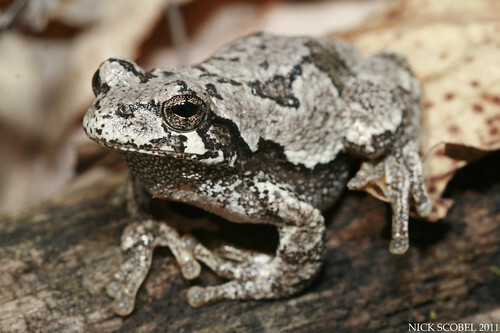 Our only two native treefrog species, the Cope's & Eastern Gray treefrog are completely indistinguishable without hearing their call or looking at their genetics. 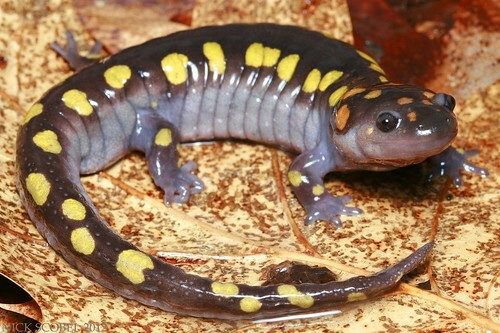 Their skin is warty and moist, and often features a base coloration and scattered darker markings. Some individuals may have a gray or white background color, while others may even be a bright green. The best diagnostic characters for these two species are the large toe pads and the dark line which extends from the eye to the hind leg. The inner thighs are also bright yellow on both species. The skin secretions of both species are toxic and are strong eye irritants which can be quite unpleasant if the eyes are rubbed after handling one, it is always wise to wash your hands after handling one to avoid an unpleasant experience. Treefrogs are founds in a wide range of habitats including deciduous or mixed forests, farm woodlots, swamps, old fields, and well-vegetated yards or suburban areas.They breed in vernal pools, hardwood swamps, and other semi-permanent bodies of water from May through July on warm, rainy nights. The call of the Eastern Gray is a loud, musical trill which lasts from 1 to 3 seconds. The call of the Cope's Gray is a faster and harsher trill which also lasts 1 to 3 seconds, but is more nasal in tone. Temperature can affect the intensity and duration of a call, so it can be difficult to distinguish these species from one another in the field based on call alone. 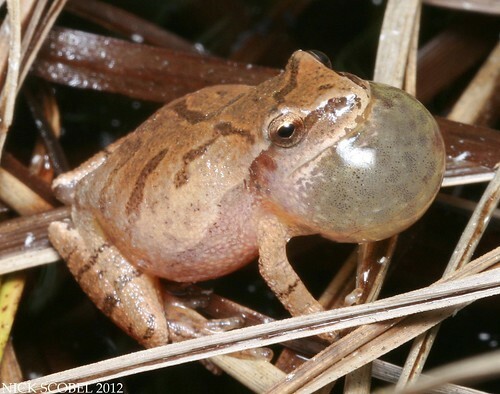 One of the most recognizable and earliest species of frog which calls in the spring, the Spring Peeper is one of the more common frogs in Michigan. It is a small frog that is generally around 1" in length and has a characteristic "X" on it's back. It may be brown, salmon, or gray in coloration and often features other dark pigmentation across the limbs. 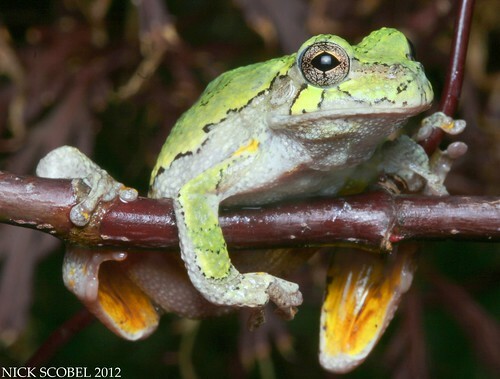 It also has small toe pads which make it a member of the treefrog family, like all other North American chorus frogs. 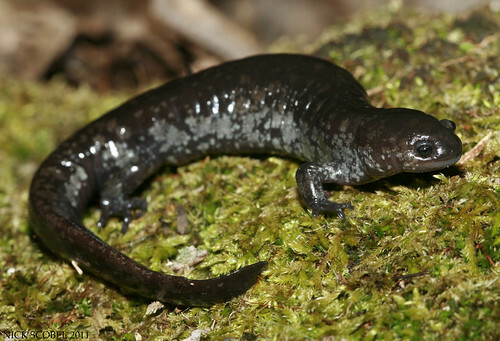 This species is most often encountered in the early spring near breeding pools in woodlands, marshes, and other areas where hundreds of individuals may form a large chorus on rainy nights. The call is a loud, high pitched "peeep" which lasts which is repeated about once a second. Males may also voice a low-pitched whistle which is likely a territorial response to another male encroaching on its calling site. 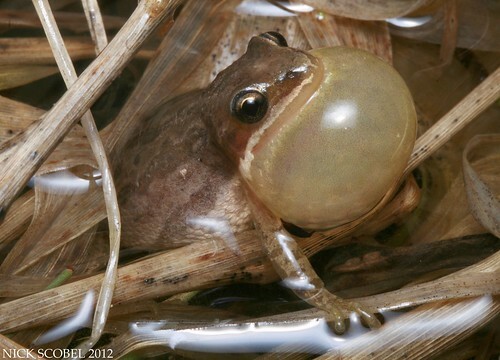 Like the Spring Peeper, the Western Chorus Frog is one of the earliest and most recognizable spring breeders in Michigan. It is a small frog that is generally around 1" in length and usually has three characteristic stipes running down it's back, though they are sometimes quite faint like individual above. It also has a noticeable cream stripe along the upper lip which is bordered by a darker band which stretches through the eye. It also has small toe pads on its feet. 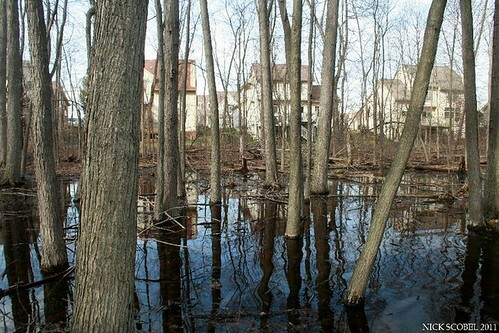 It is encountered almost exclusively during the early spring breeding season when it calls in huge numbers in marshes, vernal pools, and even roadside ditches. The call is a loud, scratch "cree-ee-ee-ek" which can be likened to the sound of pocket comb being strummed with a fingernail, the call is repeated about once every few seconds in a full chorus. 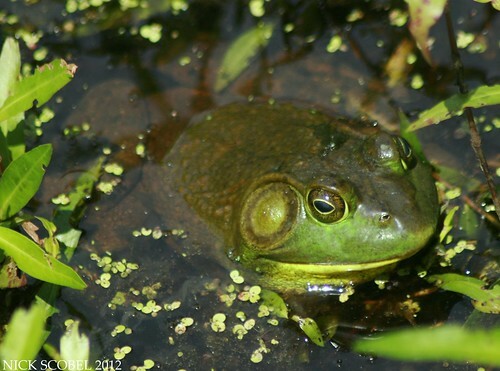 The bullfrog is the largest species of frog which inhabits Michigan, with adults topping out 3-8" snout to vent. 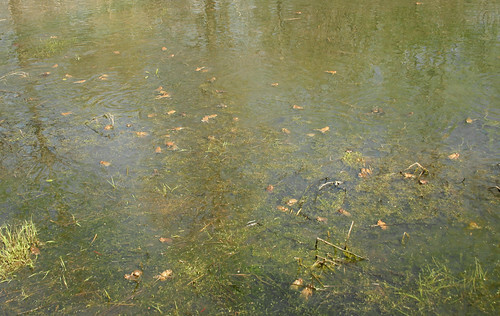 Bullfrogs inhabit a wide variety of habitats including marshes, lakes, ponds, and sometimes slow moving streams. They are voracious predators which eat anything smaller than them, sometimes even smaller frogs or neonate snakes. This species is also sexually dimorphic, meaning you can tell the difference between males and females by their appearance. The tympanum of males is much larger than the eye, while a female's tympanum is about the same size as the eye. Males are typically lager than females and often have a bright yellow throat. 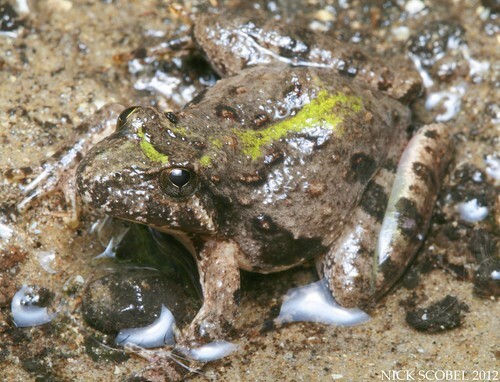 The only other species the bullfog may be confused with in Michigan would be the Northern Green Frog (Rana clamitans melanota). Young bullfrogs are often the same size and color of an adult green frog, but lack the two dorsal lateral folds which run from the eye down the back in the green frog, bullfrogs have a smooth back. Breeding occurs in mid-summer and males can call in the evenings or at night with a deep, resonating "brr-rum." Probably our most common and widespread frog species, the Northern Green Frog can be found literally anywhere water is present in Michigan. 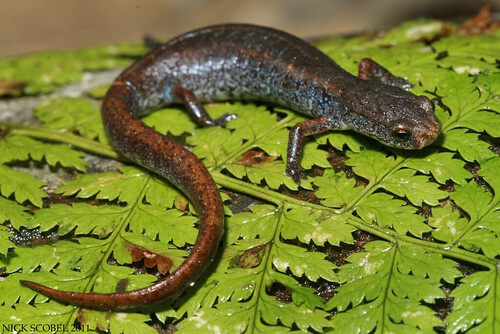 They can be found in ponds, lakes, creeks, marshes, rivers, and even in roadside ditches. 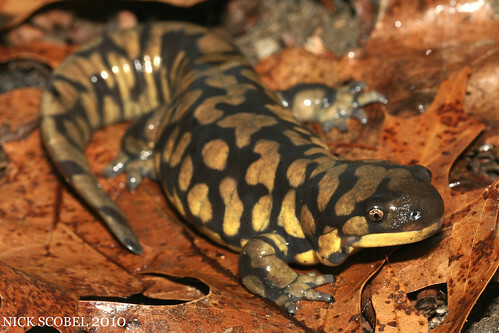 Adults are typically 2-5" in length and are extremely variable in coloration. Most have at least a little green around the head and snout, while the rest of the body may be green, brown, and even yellow in color with or without dark mottling. Thought similar in appearance to young bullfrogs, green frogs have two dorsal lateral folds which run from the back of the eyes to the dorsal lateral ridge. Breeding occurs in early to mid summer, the call is a short note that sounds like someone plucking a banjo string. 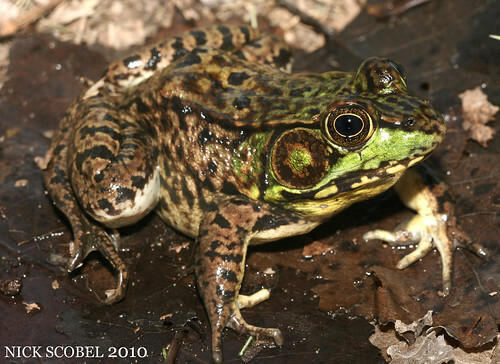 A rather uncommon species in the Great Lakes region, the pickerel frog isn't seen as commonly as it's look alike, the northern leopard frog. 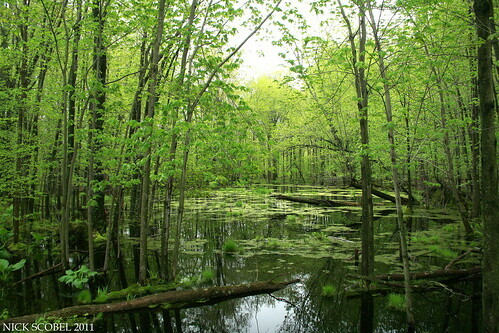 This species prefers cool waters and inhabits bogs, prairie fens, cool sandy streams, and other adjacent habitats associated with these areas. In Michigan, the pickerel frog is usually found on the west side of the state, though they are occasionally found in scattered locations in southeast Michigan. Pickerel frogs range from 2-3" as adults and do not get as large as their counterparts. Pickerel frogs are usually usually light tan in coloration with prominent, rectangular spots down their back and sides. 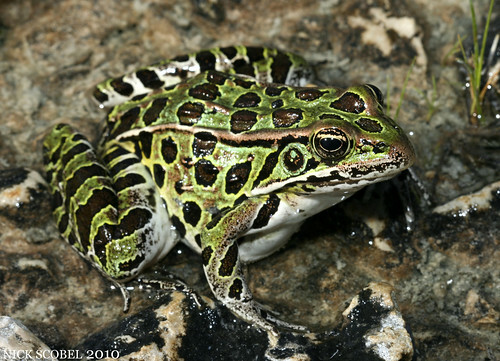 The blotches are usually more rectangular and organized than those of the leopard frog. 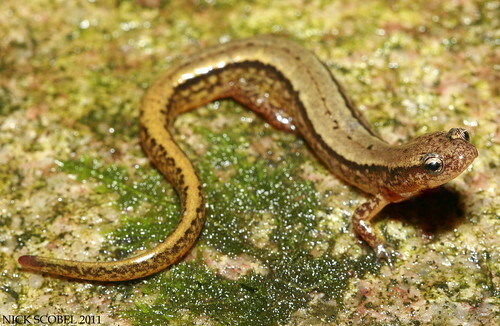 The dorsal lateral folds are always light in color, and the inner thighs are bright yellow. This bright color also helps distinguish this species from the leopard frog. Breeding takes place in April and May. 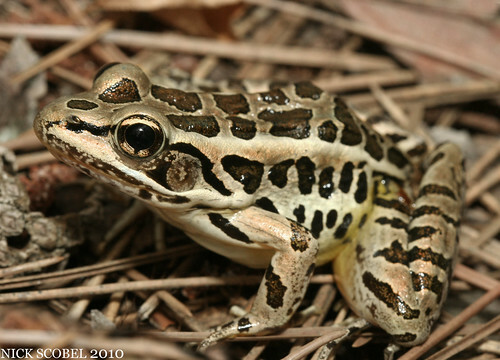 The call of the pickerel frog is a low-pitched, snore-like croak. Much more common than the pickerel frog, leopard frogs denizens of ponds, marshes, lake and stream edges, and upland fields which are adjacent to these areas. On humid mornings with plenty of dew, they can be found in large numbers in meadows before it becomes too hot. 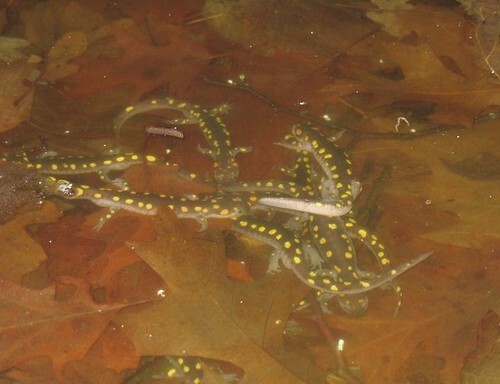 This species is extremely variable in color, some individuals may be bright green or brown with scattered spots, like the individuals pictured above and below. 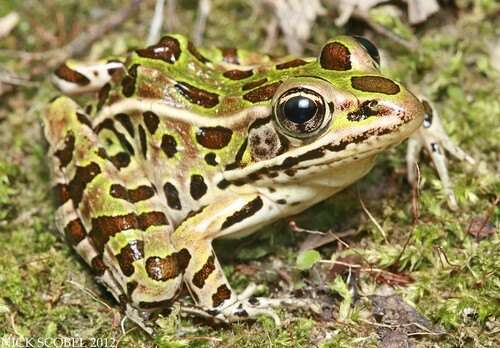 Though sometimes quite similar in appearance to the pickerel frog, the spots of the leopard frog are usually more numerous and less rectangular in appearance. The spots are often also bordered by white or yellow, and the dorsal lateral folds are usually a light coloration. Breeding occurs in April and May, and the call is a low, rumbling snore with interspersed with hoarse croaks. One of our more common frog species, the Wood Frog is an explosive breeder which is amongst the first species to call in the spring. 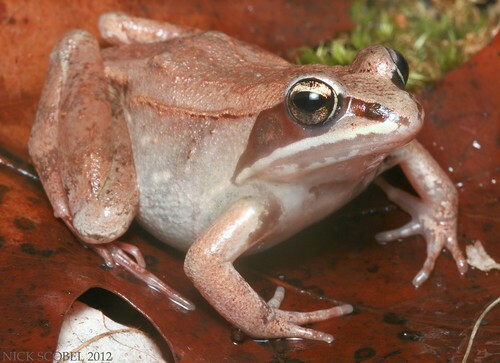 Wood frogs typically begin breeding in late March or early April with the first warm rains of spring, often in huge numbers in marshes, vernal pools, and other semi-permanent bodies of water. The call is a series of sporadic clucks, a large chorus of this species sounds like a large group of ducks from a long distance away. Like the name implies, wood frogs are denizens of deciduous, conifer, and mixed forests with ample breeding sites. They can be brown, bronze, gray, or even pink coloration. 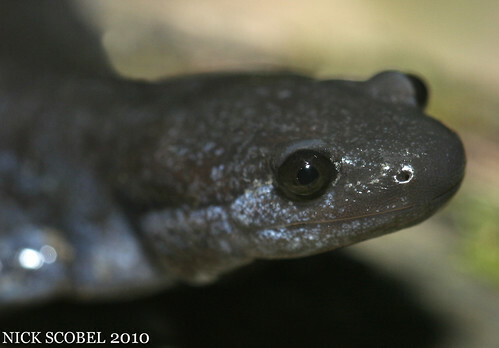 The best diagnostic characters for this species are a dark mask extends through the eye and a white stripe along the upper lip.